In partnership with Santander Bank, we have launched a new program to support enterprise development across the United Kingdom. This work is a strong demonstration of how our proprietary data-sets and analytical framework can be used to gain unique insight, plan focused initiatives, and measure impact at local, regional and national levels. 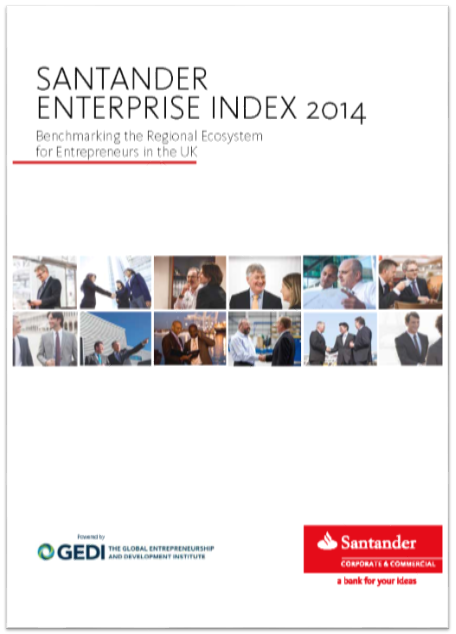 Santander Bank requested that we conduct an in-depth analysis of all UK regions and build a benchmarking index – the Santander Enterprise Index (SEI) – to guide and monitor its community development efforts. The SEI measures how effectively entrepreneurship is supported at the regional level and tracks over time the effectiveness of new policies and initiatives in UK regions. Santander Bank’s press release about its partnership with us is here. 1. Large variations within the performances of different UK regions. 2. The regional leadership positions of London and the South East are attributable to relative strengths in GEDI’s aspirational components. 3. While the East Midlands, North East and Wales share similar economic and societal infrastructure, they do not innovate new products to market, adopt new technologies, or export their products and services overseas as much as other regions because of specific weaknesses in GEDI’s aspirational components. 4. Targeting weaknesses in lower performing regions would have a larger beneficial impact on their performance than spreading resources across all sectors. In response to our quantitative assessments, qualitative analysis, and recommendations, Santander Bank launched a wide ranging package of support for entrepreneurs across all UK regions that aim to increase enterprise development by taking advantage of strengths and targeting bottlenecks to growth. During the second phase of the program, we will conduct a closer examination of the entrepreneurship ecosystems in the East Midlands and the North West through a series of stakeholder focus group discussions. This process will benchmark these two regions against similar regions elsewhere in the European Union and draw on local insights for a more qualitative assessment of bottlenecks.